As with most Microgaming sequels there is a lot of change, but the good things still remain the same. Of course we are talking about Thunderstruck 2 and the return of the Norse god of thunder Thor. Boku Slots holds the original game in quite high regard, so it is going to be interesting to see if this version changes our feelings. That being said Microgaming are renowned for making great sequels, so let’s see what happens. 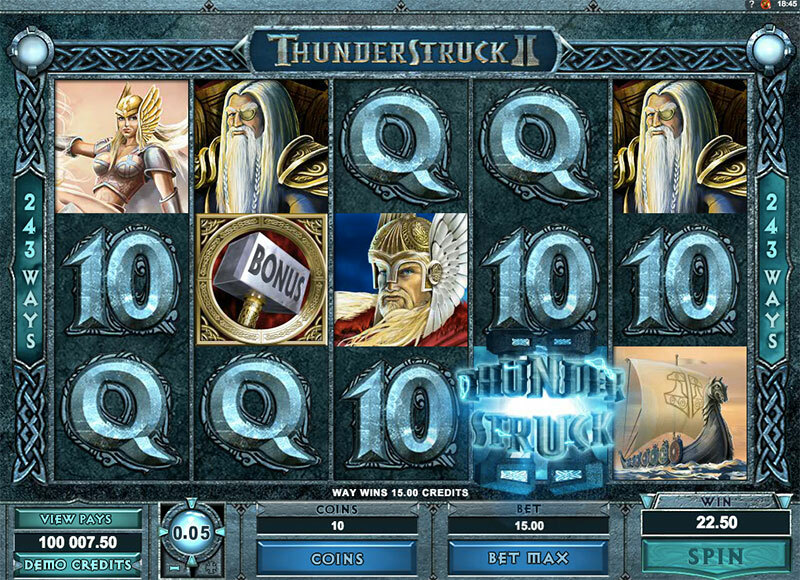 Thunderstruck 2 is a 5-reel, 243 ways to win slot game, which offers an increase in RTP from the original game to a very healthy 96.65%. We are delighted to see the graphics have had a revamp and look a bit less like a cartoon strip. The same applies to the music featured in the background which really emphasises the game play and adds to the atmosphere. Bet Amounts – Betting on Thunderstruck 2 begins at just 30p per spin and can be increased up to £15 per spin, making this once again incredibly affordable. You can increase or decrease the coin value or the coin level before every spin, to make sure the cost is right for you. Wild Symbol – Your wild symbol is the Thunderstruck 2 logo and it will substitute for all other symbols except the Hammer Scatter. The wild symbol will also double any winning combination that it helps to form. It is also the highest paying symbol in the game as well, five of the wilds on a winning combination will pay out a massive 1,000 coins. Scatter Symbol – The scatter is depicted by Thors hammer and landing three or more will trigger the bonus feature called the Great Hall of Spins. Great Hall of Spins Feature – To trigger this you need three or more scatter symbols on the reels. Once triggered you enter the hall of spins and the first four times you do, you will play the Valkyrie bonus game. After that you will see the tracker bar turning gold as you advance and unlock the extra games. Once you have unlocked the games you can pick and choose the ones you would like to play. Valkyrie – Played from the first trigger of the bonus, you will receive 10 bonus spins and x5 multiplier on those wins. Loki – You have the option to play this from the fifth trigger of the bonus. You will receive 15 bonus spins and a wild magic symbol on reel 3. The wild magic symbol will change more symbols into wilds. The number of symbols it will change is random as are the placement and you can retrigger spins in this mini game. Odin – This is played from the tenth trigger of the bonus and will allocate you with 20 bonus spins and the raven feature too. The raven will change random symbols into x2 and x3 multipliers. Landing both ravens will achieve a x6 multiplier. Thor – Finally the Thor game is played from the 15th trigger of the bonus. Receive 25 bonus spins with the rolling reels feature. Rolling reels will remove the winning symbol combinations and drop new ones into their place. The reels will then respin and for every consecutive win your multiplier will then increase by x1, up to a maximum of x5. Once no more winning combinations are made, the next bonus spin will be taken. Wildstorm Feature – This is a randomly triggered feature and when it is in action, it can prove to be highly profitable. The feature itself when triggered can turn up to 5 of the reels completely wild. As you can imagine this will create some major wins. Is Thunderstruck 2 a worthy sequel, we think so. When it boils down to it most players will probably prefer this version to the original. However, it has great crossover appeal for old school slot gamers too. The fact that once you have unlocked all of the mini games you can then pick and choose your bonus game is a huge plus to us. It gives the player the choice of what they want, instead of having to just go with the flow. If anything, this is the deal clincher and stepped it up ahead of the original.